If you want to concentrate on your online learning website and not on technicalities, Site Brand It is the perfect option for you. We offer a 1-click installation right at signup. You can order a e-learning hosting plan for only $2.91/month, along with a brand new domain name. 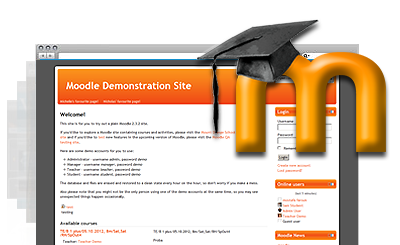 Moodle™ is a registered trademark of Martin Dougiamas and shares no connection with Site Brand It. Online School web hosting made simple with Site Brand It! Site Brand It fulfills all criteria for hosting online teaching websites. Site Brand It offers an outstanding support service.